As one of the most recent, rapidly developing seaside harbor cities, Marmaris has become a gulet charter hot spot for blue cruise. Marmaris is home to four main marinas; therefore attracting not only yachtsmen but also sailing enthusiasts from around the globe. For gulet cruise holiday guests, it is an ideal place to spend some quality time and see the sights. Blue Cruise Marmaris – There is plenty to do in and around the Marmaris region. While some debate on whether Marmaris resides in the Mediterranean or Aegean, it is actually on the border between the two seas. While the city is more on the Mediterranean side, the fascinating villages of Marmaris are lined along the shores of the Aegean sea. As a part of these unique Marmaris gulet travels, the villages can play an elemental part of a superb itinerary. Yes, you do not need to go far out into the open seas in order to be able to enjoy the ultimate pleasures of a gulet charter holiday in Turkey. The villages, as well as both the Bozburun and Datca peninsulas are filled with spectacular scenery of lush green hilltops. The region in itself provide excellent biking or hiking grounds – should you wish to combine your travels with a hybrid holiday concept. Beginning from the centrum, guests of Marmaris can stroll around the harbor. The layout of the bay and harbor is like no other coastal city in the Mediterranean of Turkey where shopping, both local and touristic; the restaurants, bars, night clubs and beaches are all parallel to each other. The prime centre revolves around the Marmaris castle hilltop known as the ‘Old Town’. From this point onward where you wish to go and see is all within very short walking distances. The promenade is beautiful and draws many – from walkers, joggers, cyclists to children on the beach. Blue Cruise Marmaris – As a central location to luxury blue voyage holidays, there are many different variations of itineraries to choose from. Heading to the east you will have the choice of visiting some history along with the unique culture found in that part of the Turkish Mediterranean – inclusive of the cuisine. Places such as the ancient cities of Caunos in Dalyan can be reached from your gulet by a local boat ride along the Dalyan river. 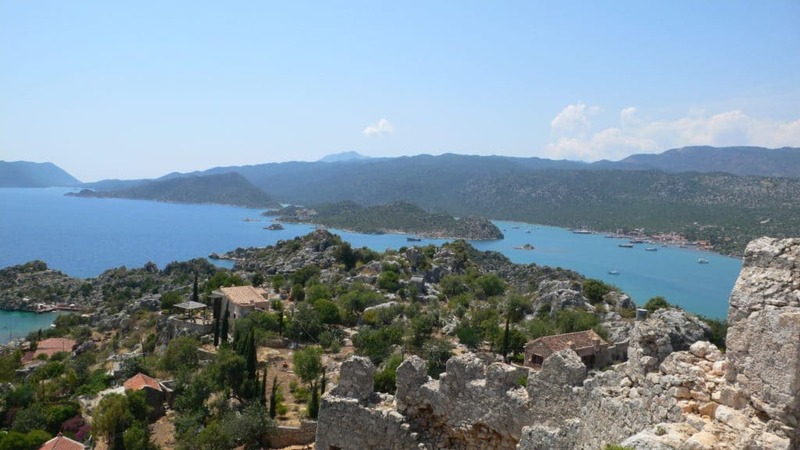 Going further into the Eastern Mediterranean region of Antalya province, a must-see is the ancient city of Simena, now-a-days known as Kekova where the sunken underwater city still remains with the ruins from the Lycian civilization. Should you point your compass to the west, a journey towards the villages of Marmaris, further into the Gulf of Gokova will take you to the bustling harbor city of Bodrum – where gulet first originated. Finally as either an addition to your gulet cruising, heading to the Southern Aegean will open way to the many exciting islands of Greece. Beginning in the Dodecanese where you can visit Rhodes, Symi and Kos; and further over to the other island groups of the Cyclades to see the famous island of Santorini and Mikonos; and the Sporades and Ionians. These itineraries are all dependent of course on the gulet you charter and how it is all planned with your agent. But the options are all there for you to discuss. Without further thought, why not explore the gulet heavens of Turkey with a luxury gulet Marmaris holiday of a lifetime!